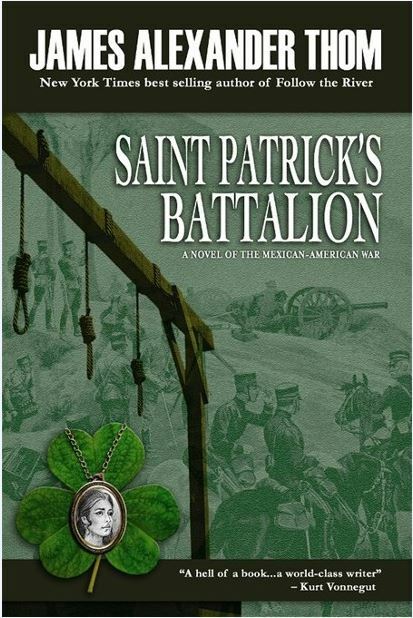 Satin Patrick’s Battalion is an historical novel about the Mexican- American War from New York Times bestselling author, James Alexander Thom. They were proud and doomed, Irish rogue cannoneers under a green silk banner, fighting against their former comrades-in-arms to defend Catholic Mexico against the invading U.S. Army. Their choices were to win, die in battle, or hang as deserters. To the Mexicans they were heroic saviors, but they were seen as despicable traitors by the West Point officers who faced their grapeshot and cannonballs on every major battlefield from Matamoros to Mexico City. 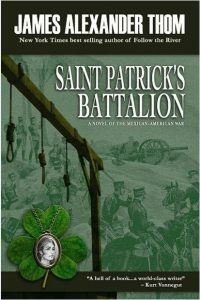 Survivors of the Irish battalion’s deadly gunnery would later lead armies against each other in Civil War, many of them – Robert E. Lee, Stonewall Jackson, Braxton Bragg – ironically deemed the same sort of traitors. 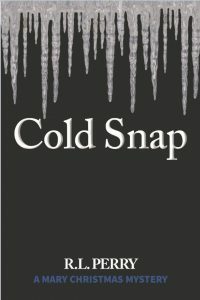 This astonishing true tale from an almost forgotten war is told through the eyes of two boys who know and admire the idealistic Irish leader John Riley: an Army camp errand boy who keeps a diary, and a Mexican military school cadet whose widowed mother becomes the Irishman’s tragic lover. Foreshadowing the Civil War, the recent invasion of Iraq, and today’s Mexican border dilemma, James Alexander Thom’s thundering, poignant novel dissects all our notions of patriotism, religious duty, principle, prejudice and imperialism, while portraying memorable men, women and children swept up in a brutal unholy war. James Alexander Thom was formerly a U.S. Marine, a newspaper and magazine editor, and member of the faculty of Indiana University Journalism School. 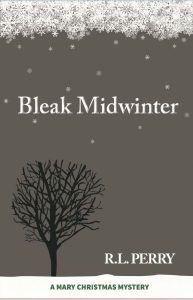 He is the acclaimed author of Follow the River, Long Knife, From Sea to Shining Sea, Panther in the Sky (for which he won the prestigious Western Writers of America Spur Award for best historical novel), Sign-Talker, The Children of First Man, and The Red Heart.